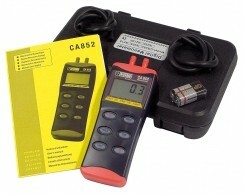 The C.A 852 Digital Manometer is ideal for measuring relative and differential pressure levels in air-conditioning installations, medical equipment and pneumatic control systems. The measurements are easy to read with its large display. Typical applications: measurement of filter clogging on air-conditioning installations, measurement of pressure losses in ventilation ducts, leakage tests in gas ducts, etc. Delivered in carrying case with 2 connection pipes,1 operating manual in 5 languages and battery.